Musical director; born at Giessen, Germany, Nov. 7, 1839; died at Munich May 13, 1900. His mother was a pianist of distinction. He studied under Vincenz Lachner at Mannheim (1852-1855), and at the Leipsic Conservatorium, principally under Hauptmann and Rietz (1855-58). In 1859 he became musical director at Saarbrücken, and in 1861 conductor of the German opera at Rotterdam, from which city he was summoned in 1864 to Carlsruhe, where in his capacity as court kapellmeister he aroused general attention by his masterly conducting of the "Meistersinger" (Feb., 1869). 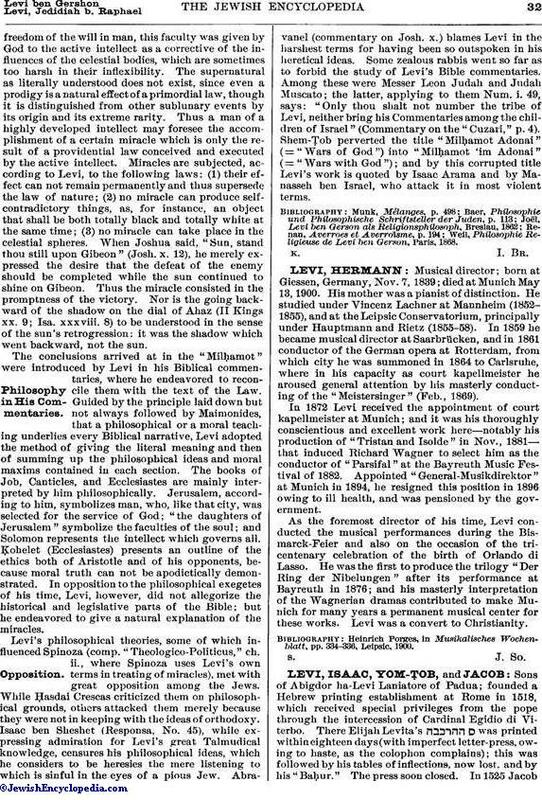 In 1872 Levi received the appointment of court kapellmeister at Munich; and it was his thoroughly conscientious and excellent work here—notably his production of "Tristan and Isolde" in Nov., 1881—that induced Richard Wagner to select him as the conductor of "Parsifal" at the Bayreuth Music Festival of 1882. Appointed "General-Musikdirektor" at Munich in 1894, he resigned this position in 1896 owing to ill health, and was pensioned by the government. As the foremost director of his time, Levi conducted the musical performances during the Bismarck-Feier and also on the occasion of the tricentenary celebration of the birth of Orlando di Lasso. He was the first to produce the trilogy "Der Ring der Nibelungen" after its performance at Bayreuth in 1876; and his masterly interpretation of the Wagnerian dramas contributed to make Munich for many years a permanent musical center for these works. Levi was a convert to Christianity. Heinrich Porges, in Musikalisches Wochenblatt, pp. 334-336, Leipsic, 1900.